MIDIval PunditZ consists of the duo of Gaurav Raina and Tapan Raj who write, produce and remix collectively. The sound can be labeled as Indian Electronica but more specifically it's the perfect blend of South Asian traditional sounds with the electronic edge of the Western world. 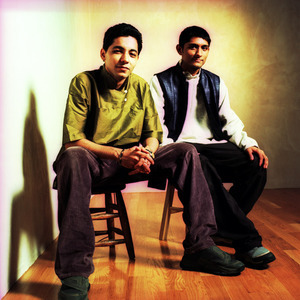 Since releasing their first Six Degrees record in 2002, the Punditz have created a Bollywood film score, given tracks for a Hollywood film (Closer), collaborated with some of the greatest classical musicians of India, and contributed to several Six Degrees compilations. Since releasing their first Six Degrees record in 2002, the Punditz have created a Bollywood film score, given tracks for a Hollywood film (Closer), collaborated with some of the greatest classical musicians of India, and contributed to several Six Degrees compilations. Their version of Zeppelin's "Four Sticks," in fact, was originally done for the Six Degrees 10th anniversary record, and revealed Raina and Raj's abiding love for classic rock. Of course, this all plays well in the clubs of Mumbai and New Delhi. But Midival Punditz have also become a genuinely international band, attracting critical acclaim in Europe and the States while performing their high-energy live show at festivals such as Glastonbury and selling out venues from New York to San Francisco. Collaborations with rising star Anoushka Shankar, "it" Bollywood composers Salim & Sulaiman, Sting, Norah Jones, and countless others in India and abroad have cemented their reputation as both talented producers and musical visionaries. They are part of a remarkable infusion of Indian culture around the world. The world is on shuffle and the Punditz are on the playlist.